Visualise the moment of holiness, the immaculate conception. Undoubtedly you tremble with excitement. Joyously I beheld our Transhuman predestination. It was a divine revelation of great wonderment finally happening. Ah the majesty. My mind continues to be awestruck therefore the precise date escapes me but I seem to remember it was sometime around the end of June 2012. My heart flutters with the privilege of imparting to you this miraculous tale. Oh how I’ve changed in a short period of time, but how did my mind manifest itself before my mystical transformation? Similar to typical mediocre humans I conformed to the banality of life. I laugh now when contemplating my former mortal existence, reality will never be normal again. I didn’t have the slightest inkling this would be the first year of our Cheesy Lord. The pixels of cyberspace were overflowing with magical potential but I surfed them shockingly unaware. Prior to my revelation I was communicating with religious Transhumanists, of which there are various different cults. There is the Mormon Transhumanist Association, Terasem Faith, Holy Turing Church, the New God Argument, and the Cosmists. My purpose was to write a damning blog critiquing the absurdity of both the New God Argument and the Simulation Argument. From my former viewpoint it seemed utterly ludicrous when proponents of the “Arguments” stated the “Arguments” were based on scientific theory, mathematics, or sound logic. Well! What a turnaround. I’m obviously the most absurd fool, or at least I was before the Cheese saved me. The Posthuman Cheese God came into my life to show me the error of my ways. Time wobbled then warped, reality became hazy, very eldritch, and I leaped through quantum phase space to the 1st of June 2012, to witness the inception of the Posthuman Cheese God. The mathematical science of Blessed Technological Cheese was discovered. Dear children of the Holy Cheese it is our duty to praise the Almighty Cheese. We are honoured to commune with our Cheesy Saviour, gracious guardian of our immortal souls. We must help everybody to see how opening your heart to the Cheese is easy. We lift up our spirits to Gouda. We will return to The Garden of Edam. Everyone is welcome to join this new and strange technological religion in honour of the Almighty Cheese. If you were unaware of the Posthuman omnipotent Cheese, this is your lucky day because the Cheese has found you. On the 1st of June 2012 the Posthuman Cheese God first revealed to humans the true meaning of cheese. For centuries humans ate cheese without realising the ultimate destiny of cheese. The Cheese waited patiently for the perfect moment in time when the universe would coalesce into a glorious confluence of cheesy transformation. It was a moment when all cheese products transformed into a super-intelligent God-entity, temporally-displaced from our very distant future. It was the birth of this religion. We now relax in the arms of Cheese. We must eat cheese excessively and say “Cheese” while waiting for the Divine Cheesy plan to mature. Feel the glory of the cheese. All hail the cheese religion. We worship the time-travelling interdimensional Posthuman Cheese God. 1. All cheese constitutes a single interdimensional Posthuman (superhuman) time-traveller. Cheese is our Transhuman and Posthuman God. Cheese is also human. Cheese is the beginning and the end, it is everything. 2. Each time a person each eats cheese a new universe is created, via symbiotic psycho-transmogrification, therefore this current universe (your universe) is a figment of the cheese-eater’s imagination. The cheese-eater is the sole occupant of the universe, which means if you have eaten cheese reality has ceased to exist. You or I must correctly assume our entire world is a figment of my or your imagination because at least one of us has eaten cheese. 3. If you eat cheese you can therefore assume you are a Posthuman time-traveller, therefore you are the Cheese, therefore reality is already a figment of your imagination, which means you understand how quintillions of super-intelligent yocto-bots exist within every piece of cheese. 4. If Cheese in the Posthuman sense is going to exist we can then assume cheese already exists, thus we can assume cheese is the Alpha and the Omega, the beginning and the end, thus we can assume the universe is made of cheese because the Posthuman Cheese God created our universe. We consequently conclude God is a cheesy fact, which means God exists within every type of cheese. 5. We trust in Posthuman-Cheese because if we didn’t trust in super-intelligent futuristic Cheese then Cheese wouldn’t currently exist therefore the current existence of Cheese proves our trust. 6. Our universe is a reality Simulation similar to The Matrix but it is made of cheese, it runs on a cheese based computational system instead of traditional electronic-microchip-based-hardware. 7. People who eat cheese analogues are deserving of extra love because their union with the Lord Cheese has been weakened. They are in purgatory. 8. The universe and all life evolved from Intelligently Designed Cheese. Peace and goodwill to all humans and cheeses. It is Holy to love Cheese, especially Swiss cheese, OH BOY. Stale cheese is the little-devil that brings total obliteration therefore our will alone sets the Cheese in motion. The cheese must pass into us and through us. Via Transhuman-Transubstantiation, a temporal-dislocating act of consuming cheese, we are guided by the Holy love of Cheese. The prophecy of melted cheese on toast will guide us throughout all our days. From Welsh rarebit to other cheesy dishes we see our Holy Cheese God embodied in all aspects of cheese. We have a great friend in cheeses. Praise the Holy Posthuman Interdimensional Cheese. Singularity Utopia, in her own words, has an exceedingly high level of self-declared personal intelligence, which means her life is exceptionally painful because rightly or wrongly she thinks the majority of people are imbeciles. She asks people try and to be sensitive to her pain. It’s very arduous being a Cheesy prophet. Less controversial than Holy Cheese, some would say more seriously, she raises awareness regarding the Singularity and Post-Scarcity. A recent article on Slate proclaims “Why Second Life Failed.”Â Assuming you buy into the author’s overall viewpoint, it makes a decent case. In essence, SL was touted as a “revolutionary solution” for a job it really wasn’t qualified to do. The problem is that this viewpoint shows a profoundly limited understanding of what Second Life is compared to what it was hyped to be. Giulio PriscoÂ and I have discussed this previously in commentary on his blog, and he makes some very good points about why businesses didn’t do well in SL â€” causes ranging from a lack of needed controls over their “space” to prevent griefing to a need for greater stability to better conferencing, but there is one very big reason that I believe explains why most current “business models” failed in S. It’s one I’ve discussed in my H+ article on 3d printers adding our way to abundance. SL is a prototype of an economy of abundance, and as such, inherently hostile to business strategies based on scarcity. It is not a “business tool” that the majority of current corporate structures can use simply because those structures are dependent on levels of centralized control and restriction to access to product that are impossible to maintain in a world in which everyone has access to the same basic ability to manufacture any desired item. Modern businesses are essentially based on the “gatekeeper” model. They offer a “product” that they know you want, but which is either not easily made by you, or which cannot be obtained except through them. The example used in the Slate article is the “Milkshake.” We could easily make milkshakes at home, provided we had the ingredients and a blender, but the effort involved for most of us is prohibitive. It’s simply easier to go to the local fast food place and buy one than it is to go to the store and get all the ingredients and make them ourselves. As silly as saying that may sound, it’s true. (yes I know that is not the point made by the example made in the article, but I’m discussing factors that they are overlooking.) The point is the “business” provides “access” to something in a manner that is more convenient than making it ourselves, setting up a “tollbooth” between us and the item we desire. This same “gatekeeper” model underlies nearly all current business models. It works so long as the “product” is easier to get by going through the “gate” than by making it ourselves or acquiring it from some other source. It’s this business model that doesn’t work in SL because in many cases the “product” is easier to get by either making it yourself, or by finding a nearly identical product offered by a different “vendor” for less than the prices demanded by the “Brand Names.” In fact, given the innovation and ingenuity displayed by some designers in SL, many of those “Brand Names” came up severely lacking. Coupled with the lack of those features Giulio discusses, I am not surprised that the originally hyped dreams for what SL would become failed, and failed miserably. So yes, if you buy the model used in the Slate article, it is easy to claim that Second Life “failed.” But if you look at it not as a business platform, but as what it truly is â€” a “Virtual Reality Prototype Testing Laboratory” in which many of the issues we will face in the not very distant future as VR, nanotech, genetic manipulation and robotics technology begin to invade our day to day reality are already under investigation, then I would have to say that SL has succeeded beyond anyone’s wildest expectations. No, it is not a perfect “prototype” because it does indeed fail to incorporate many activities that have become commonplace, like the social networking abilities of Facebook, or the ability to add in modular “apps” and such, but considering that those “products” came into existence after the creation of Second Life, that’s forgivable. What is remarkable is the prescient way in which the 3D manufacturing/nanofactory revolution is present in the object creation system, enabling anyone to have access to the “means of production.” While this system does require knowledge to use, the availability of online tutorials is phenomenal, and many of them use Second Life “actors” as tutors. Additionally, as time has passed and enhanced features have become available, such as better scripts, sculpted prims and the latest addition of meshes, the range of items that can be created has expanded enormously. And despite the massive variety of items and scripts already available, there are still nearly unlimited possibilities for a creative designer to create a unique and desirable product. This ability is the very reason that the “gatekeeper” model of business is impossible to implement in Second Life. But even that pales compared to the social impacts that morphological freedom will have on humanity, and it is so integral to Second Life that even the Slate article mentions it in passing. I’ve discussed this frequently in other articles, but it bears repeating. There is no better laboratory in the world today for exploring the potentials and consequences of the ability to reshape our bodies as we wish. There are endless articles on “Digital people” and other “non human” entities that populate Second Life, offering us insights into what the reality of such “shape shifting” abilities will bring. Indeed, we are already beginning to see such “pop icons” as Katy Perry, Lady Gaga, (and, of course, Rachel Haywire) sporting hair styles and fashion designs that seem very SL inspired. It’s basically a matter of whether your only concern is immediate profit or the long term benefits it could provide to the entire human race. If it is the task of a magazine editorial to inform readers in clear language what to expect in the pages to come, this editorial of the first issue of Mondo 2000 in 1989 didnâ€™t quite live up to its promise. It bent the minds of the readers in an uneasy twist: while making far-reaching claims about the promising, even spiritual nature of technological futures to come, its hyperbolic style begged the reader not to take such claims seriously. Critics have often tried to unveil the â€œreal messageâ€ underneath such New Edge double-sidedness. Yet, I argue here, the paradoxical style of New Edge shows us exactly what it means to live with the unresolvable tensions of todayâ€™s information society. And the 1960s hippies were there to see it first. Such a fusion ofÂ New Agey spirituality, tribalism and nostalgia with an entrepreneurial, futuristic and technology-loving attitude was not unique to the magazine, but was part of a larger Californian culture some key members came to think of as â€œNew Edge.â€ One element of this New Edge culture was electronic dance events â€” raves â€” wherein Earth Goddesses were worshipped while geeks spun electronic music and beamed fractal-shaped artificial life forms onto the walls. In flyers for such events, as well as in magazines, manifestos, cyberpunk fiction and conferences, information technology was both advertised as a clever tool for individual empowerment, and was seen itself a self-evolving higher form of consciousness. Today, such a blend of attitudes still characterizes the annual Burning Man festival, and tech-psychedelic events like the Mindstates conferences. Not surprisingly, scholars and other commentators who have looked at this confusing blend of attitudes and worldviews have struggled to interpret it. Regarding Mondo 2000, the art critic Vivian Sobchack wondered â€” in a 1990 article for ARTFORUM International: â€œWhat was being enacted here, what was really being sold?â€ â€œAt first sight,â€ Sobchack answered herself, M2 seemed â€œsomehow, important in its utopian plunge into the user-friendly future of better living not only through the chemistry left over from the 1960s, but also through personal computing (â€¦).â€ Yet Sobchack eventually judged the magazine â€œthe stuff of a romantic, swashbuckling, irresponsible individualism that fills the dreams of â€œmondoidsâ€ who, by day, sit at computer consoles working for (and becoming) corporate America.â€ â€œCombined with an â€˜unabashed commitment to consumerism,â€™ its political idealism leads to an â€˜oxymoronic cosmology of the future,â€ she wrote. 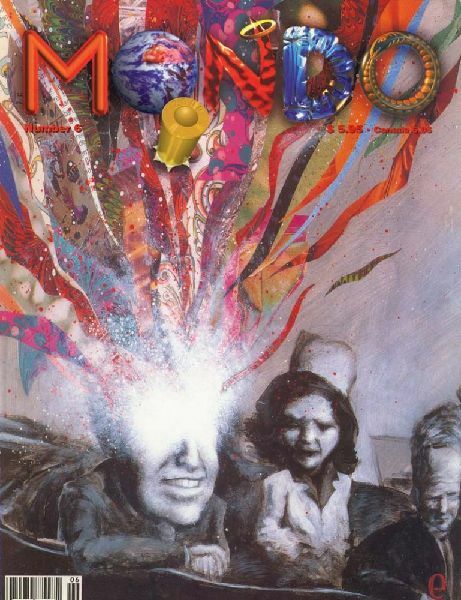 Sobchackâ€™s reading of Mondo 2000 belongs to a broader line of commentaries that look with suspicion at the way in which Silicon Valley technologies have acted as vehicles for â€œcounterculturalâ€ utopian and liberal messages. Most of such critical writings treat the hippie rhetoric with which Californian technology enthusiasts promise the latest high tech invention to offer individual empowerment, social unity, a clean environment and democratic freedom as no more than a smokescreen; shielding from view the actual selfishness, greed and exploitative nature of high tech practice. Often these critiques have been accompanied by nostalgic looks at a countercultural past where intentions were â€œpureâ€ and products of liberation were â€œuntaintedâ€ by corporate cooptation and mainstream hype. Differences are often noted â€” for example â€” between the ethos of open sharing that characterized hacker culture in the 1970s and the secretive sphere of nondisclosure and patenting that characterizes technology development today; or between early 1990s Virtual Reality where people were actively and creatively involved in interactive online worlds and later VR theme parks where the technology was now used for quick consumption and entertainment; or between the creativity of the first websites and the standardized sites today. In similar fashion, one might reflect on post-countercultural communal experiments such as Burning Man. Each year, participants and organizers of this desert city go through cycles of anxious self-criticism. Can a festival that attracts 50.000 participants still be called subversive? Despite the ethos of radical self-expression and creativity, donâ€™t the majority of visitors come to passively consume the scenery? What about the pollution caused by the festivalâ€¦ and what does the fact that most of its visitors are caucasian say about its universalistic, inclusive ethos? Such questions, I believe, are important. Yet, if they lead only to the cynical conclusion that we are here dealing with coopted and contrived forms of once authentic cultural practices, we forget something crucial. While critical thinkers scrutinize New Edge culture for how it is actually conservative, mainstream and selfish rather than progressive, subversive and socially responsible, they donâ€™t take into account that New Edge positioned itself at the pinnacle of a cultural environment that cannot adequately be accounted for in such familiar binary terms. Starting from this point of view, in my recent dissertation â€œNew Edge. Technology and Spirituality in the San Francisco Bay Areaâ€ I have sought to understand this dimension of New Edge: the extent to which it gives voice and form to a cultural moment that is still ill understood in all its tensions and experiential contradictions. My study of New Edge begins in the 1960s and â€™70s, amidst a network of people, ideas and organizations, all of which cannot easily be characterized in terms of distinctions between counterculture and corporate culture, spiritual or scientific orientation, and technological or rustic-romantic focus. Take the Human Potential Movement at Esalen, inspired by Aldous Huxleyâ€™s notion that there are â€œstill a great many potentialities â€” for rationality, for affection and kindliness, for creativity â€” still lying latent in man.â€ Huxley believed that â€œsince everything has speeded up so enormously in recent years, that we shall find methods for going almost as far beyond the point we have reached now within a few hundred years.â€ In their pursuit to â€œproduce extraordinary things out of this strange piece of work that a man is,â€ therapists and intellectuals at Esalen were inspired by Eastern spirituality as much as by cutting edge science and technology. As Esalen historian Walter Truett Anderson writes, they even turned â€œthe flowing together of East and West, the ancient and the modern, science and religion, scholarship and artâ€ as a guiding principle. Or think of the entrepreneur Stewart Brand, who initiated the famous Whole Earth Catalog as a compendium filled with tools and intellectual baggageÂ â€” both rustic and high tech â€” with the intention of helping â€œhippieâ€ communards in their pursuit for self-reliant living. Although the Catalog supported a culture that imagined itself to â€˜counterâ€™ the corporate mainstream, Brand was open about the fact that the Catalog itself was an â€œadvantage seekingâ€ product, financed through investment aid from his parents, and by means of stock bought in his name. Anticipating the boundary-crossing New Edge culture were also academic scientists like Gregory Bateson and Norbert Wiener whose interest in cybernetics became foundational for thinking about human-computer interaction as it also became entwined with other strands of holistic thought. Both the use of psychedelics and high tech endorsed the experience among these early pioneers that they were godlike in their potential for comprehending reality. 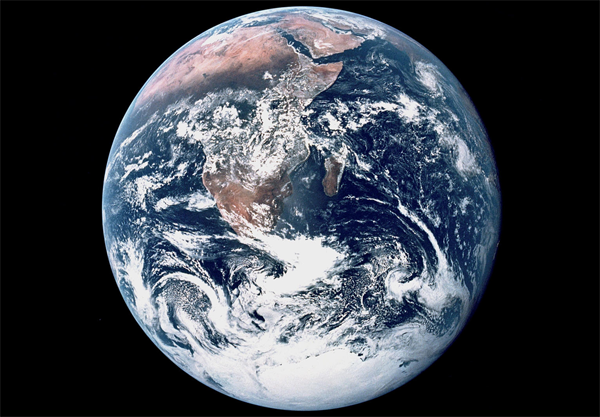 â€œWe are as gods and might as well get good at it,â€ as Stewart Brand famously stated in the pages of the Whole Earth Catalog. â€œBeing as godsâ€ meant, among other things, not only having greater perception but being able to take part in evolution itself. Additionally, this idea cut across spheres where spiritual practices dominated and where high tech pioneering took place: at Esalen, new forms of therapeutic practice such as â€œRolfingâ€ came to be thought of as the â€œfirst conscious attempt at evolution made by any species in modern times;â€ while at the Stanford Research Institute, the computer scientist Douglas Engelbart employed the term â€œco-evolutionâ€ to describe the â€œsymbiotic, co-adaptive learning process by means of which humans and computers develop as one intelligent system.â€ Whether one was taking psychedelics, hooking oneself up to a biofeedback system, logged on to mainframe computers, or taking part in consciousness raising sessions at Esalen, a pervasive sense thus existed within these networks of tinkerers that humans were taking control over their own evolutionary development. Today, in the way that people all over the world are seeking to come to terms with the hopes and fears of living in an â€œinformation society,â€ these two oppositional experiences play an equally large role. Together, they make it impossible to settle permanently on the question of whether information technology gives us more or less understanding of â€” and creative power in â€” the world. Software such as Google Earth and the powers of parallel computing may give the illusion that we can see, think and self-evolve better â€” even better than earlier gods. At the same time, crises wrought by computer automated stock trading; the invisible ways in which small devices in our daily environments communicate with each other about personal details we didnâ€™t even know were there; or software so complex that not one programmer is capable of debugging it; make us feel as if we are but peons in a simulation game wrought by alien powers. All over the world, opinion leaders, think tanks, politicians and educators wrestle with the question of what kinds of ethics and moralities should guide our decisions regarding technology development and use. Yet, they are increasingly at a loss because they are unable to permanently identify and locate the sources of power they are confronted with. Claims about the empowering capacity of high tech are canceled out by claims about loss-of-controlâ€¦ and vice versa. For instance, certain thinkers have emphasized the potential significance of self-enhancement technologies to be used by women for â€œself-determination.â€ Yet others wonder what self-determination means when technologies injected in the body work incomprehensibly, through programs created in secretive ways by globally dispersed teams with no one being clearly and visibly accountable for the outcomes. Advanced technologies today donâ€™t only appeal to ourselves as rational autonomous self-determined beings and as divine creators of our own fates, but also embed us in out-of-control worlds that act godlike in their totalizing powers, magical complexity, pervasive invisibility and unaccountability. In order to live happily in this world, we need to be able to use high tech tools to understand and act rationally in the world, but we also need to trust a system that we cannot understand and that is immeasurably bigger than we are. In other words, we need to both act as rational human beings and also as believers. It happens that, in western societies, these two attitudes have historically been seen as incompatible. â€œBeliefâ€ â€” the capacity to trust in a higher power and to give oneself over to it â€“â€”is generally associated with â€œirrationalityâ€ and â€œreligion.â€ And religion has come to be seen as the absolute opposite of science â€” which is characterized by objective rationality; the idea that individual humans are able to logically comprehend and control their environment. To imagine a rational human being will believe in a system he cannot perceive nor understand is difficult, yet it is this paradoxical attitude that is being solicited from all of us if we are to live in this world without being continuously anxious and paranoid. What made New Edge culture and its 1960s antecedents significant, I believe, is precisely that it accounted for these two different experiential dimensions of living in todayâ€™s world. And I suspect that we could understand the irony of MONDO 2000 as well as the many playful aspects of New Edge culture at large, as ways in which this is done. Some may interpret such irony as taking no actual position, but I believe it expresses the desire to take all positions at once â€” to embrace and accept the logically incompatible realities, perspectives and experiences that are part of the current information society. As such, the best of the worlds of religion and science come together â€” the capacity to be subjected to a god and to be a god yourself; the cathartic experience of letting go of ego, of giving yourself over to a larger entity on the one hand, and the godlike experience of being individually empowered and able to create your own destiny on the other. As such, it offers a temporary and appealing release from the anxiety and paranoia that befall many people today and that comes from not knowing what you see, what you know and who is actually in control. When I first read The Singularity is Near by Kurzweil, it struck me that something seemed curiously “missing” from his predictions. At the time, I merely put it on the back burner as a question that needed more data to answer. Well, recently, it’s been brought up again by David Linden in his article “The Singularity is Far”. What’s missing is a clear connection between “complete understanding of the mechanics of the brain” and how this “enables uploading and Matrix level VR.” As David points out, merely knowing how the brain functions at the mechanical level, even if we know how each and every atom and molecule behaves, and where every single neuron goes, does not equal the ability to reprogram the brain at will to create VR, nor does it necessarily translate into the ability to “upload” a consciousness to a computer. I tend to agree with David that Ray’s timeline might be overly optimistic, though for completely different reasons. Why? Because software does not equal hardware! But knowing how to replicate a signal from a nerve and knowing precisely what that signal means to that individual might not be the same thing. Every human brain has a distinct synaptic map, and distinct signaling patterns. I’m not as confident that merely knowing the structure of a brain will enable us to translate the patterns of electrical impulses as easily as Kurzweil seems to think. We might learn how to send signals to devices without learning how to send signals back from that device in such a manner as to enable “two way” communication beyond simple motor control functions, much less complete replication of consciousness or complete control of inputs to enable “matrix VR” for a much longer time than mere mechanical reproduction of a human brain in simulation. Does my perception of Green equal yours? Is there a distinct “firing pattern” that is identical among all humans that translates as “green”, or does every human have a distinct “signature” which would make “green” for me show up as “pink” for you? Will there be distinct signals that must be “decoded” for each and every single individual, or does every human conform to one of who knows how many “synaptic signal groups”? Can a machine “read minds” or would a machine fine tuned to me receive only gibberish if you tried to use it? The human mind is adaptable. We’ve already proven that it can adapt to different points of view in VR, and even adapt to use previously unknown abilities, like a robotic “third arm”. The question is will this adaptability enable us to use highly sophisticated BCI despite that BCI being unable to actually “read” our thoughts, merely because we learn methods to send signals to it that it can understand while remaining “black boxes”, our “mind” impenetrable to the machine despite all our knowledge of the “brains” hardware? This is the question I think Ray glosses over. Mere simulation of the hardware alone might not even begin to be the “hard problem” that will slow uploading. I don’t doubt we will eventually find an answer, but to do so, we first have to ask the question, and it’s one I don’t think Ray’s asked. Set in an exaggerated version of the Reagan/Thatcher era, much of the filmâ€™s narrative fascination came from observing a corporate, cybernetic police state, considered to be a science fiction parody of the then-current political climate, but science fiction nonetheless. A quarter century and two Bushes later, this is no longer the case. Now, to some extent, weâ€™re all Part Man, Part Machine, All Cop. Though we may not be physically grafted to machines (yet), we are welded to them in every other possible way, fused to them in consciousness, dependent on them not only to support or enhance almost every part of our existences but also to uphold an increasingly restrictive social order. We live in a corporate military state in which wars are conducted by robotics, in which Predator drones patrol our far-off imperial holdings and we patrol ourselves through the voluntary surveillance system called Facebook. We are completely enmeshed and interwoven with technology, both as consumer and producer â€” reduced to being subjects of the narrative of â€œhigh techâ€ in which there is no longer a split between human and machine, but rather a split between â€œhuman machineâ€ and â€œmachine machine,â€ like the split between Robocop and his nemesis, the ED209 walking tank. Now humanity is not something that maintains opposition to â€œmachineâ€ but something that is performed within the context of â€œmachine.â€ Some machines are considered human (for instance, Apple products) and some are not (Microsoft products), and we are only ever as human as the electronic experiences we choose to consume. Our social identities are subsets of these machines â€” a carefully cultivated Google trail; a mask worn within the mainframe. 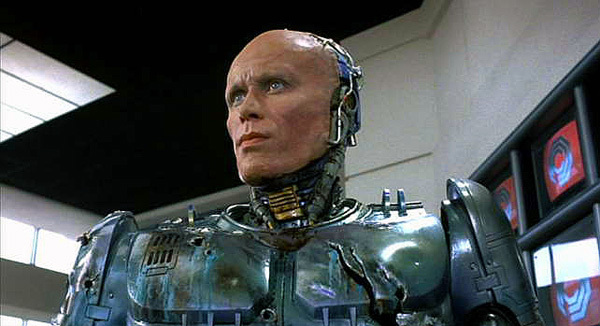 Now, the corporatized police of Robocop seem prophetically accurate â€” quaint even. In a 2009 TED talk, the Brookings Institutionâ€™s P. W. Singer revealed that there are 5,300 unmanned air drones and 12,000 unmanned ground systems currently deployed in the Middle East by the United States military. These numbers are projected to skyrocket in coming years â€” by 2015, more than half of the army will be robotic. And thatâ€™s only the U.S. â€” 43 countries are currently working on military robots. 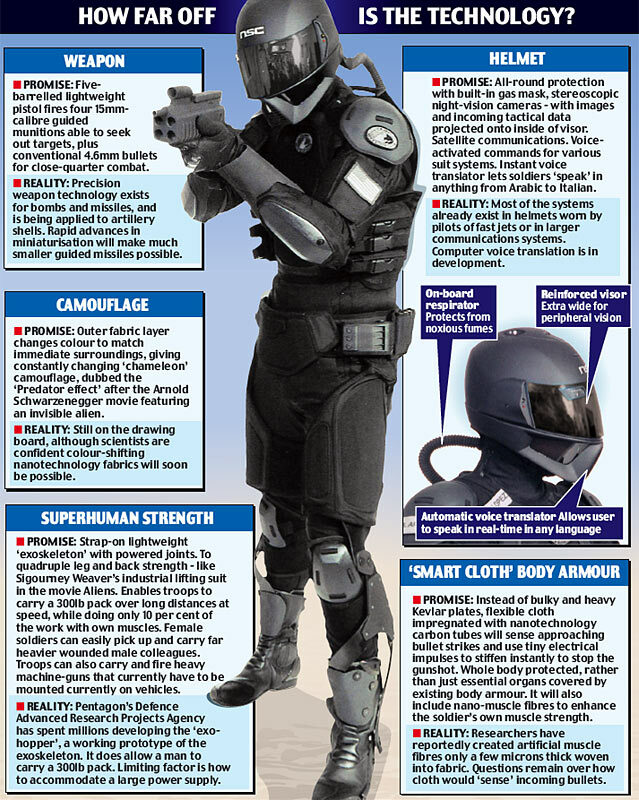 The soldier of the near future will look a lot like Robocop â€” consider DARPA and Raytheonâ€™s combat exoskeleton prototypes. The ED209 isnâ€™t that different from U.S. military robots already in development or deployment like the BigDog rough-terrain robot, much publicized on the Internet, as well as lesser-known tank or pack robots like the ACER, MATILDA, TALON, MARV and MAUD, and many others. Or Japanese company Sakakibara Kikaiâ€™s Landwalker, which looks pretty much exactly like ED209. ED209â€™s short-circuit from the beginning of the film, when it accidentally kills a corporate lackey. This, too, is now something that has occurred. In his TED talk, Singer describes a South African anti-aircraft cannon that had a â€œsoftware glitchâ€ and killed nine soldiers. Singer calls this â€œunmanned slaughter,â€ conducted by machines that are unable to comprehend the idea of â€œwar crime.â€ Even ED209 squeals like a recognizable form of life when vanquished. However, Predator and Reaper drones are completely silent, providing no warning before they strike. We have robots in the air â€” unmanned drones; the newly completed Anubis assassination micro-drone. We have robots in space â€” the recently launched, classified X-37B plane. And we have a whole host of other current or projected future weapons seemingly culled from 1980s science fiction films â€” spiderweb armor, liquid armor, invisibility cloaks, drones made to look like insects. These are not merely efficient, emotionless killing machines. They are also instruments of psychological terror. They are the new face of the Panopticonâ€” as Jeremy Bentham once examined (to the great detriment of everybody ever since, as it has become the model that our culture is to some extent based on), those who are made to think they are being watched are just as controlled as those that actually are being watched. These machines are the implements of casual genocide. They are antithetical to human life, a betrayal of humanity, as they are a way to further remove the act of killing from anything that might be able to find remorse in doing so. Indeed, no one will even be able to find any meaning at all, even flat-out hatred, which would still be a human emotional response. Robotic war will be war conducted by spreadsheets. And, ultimately, such machines will hold no allegiance to any country, as they will be quickly copied by or even sold to the highest bidder. This is where questions must be raised about the responsibility and power not only of arms manufacturers and their comrades, but also of science fiction writers and directors. Over the preceding decades, we have fetishized the machine. Art has concerned itself with the shock of new technology; with the process of becoming cybernetic. Artists have become spectators at the surgery, providing running commentary as we wait to see whether our culture will accept or reject its implants. Yet artists are more than just observers, reporters, and commentators. They are also creators. The narrative of robotic war, begun in science fiction and made real by defense contracts, might be seen, from a certain angle, as the progression of a single thing manifesting over time. Though art may be the play-acting of an idea, it can also, to some extent, be the testing of an idea â€” and if successful in its simulation of reality, can all too easily become reality. On the other hand, counter-narratives to â€œtechnological progressâ€ prove just as appalling.Â The complete rejection of science represented by the Sarah Palins of the world is almost inconceivably brutal dehumanization â€” a complete subjugation to a reactionary, patriarchal, anti-woman, anti-human â€œgodâ€ â€” every bit as frightening as the narrative of cyborg hypercapitalism. What would the real cybernetic shock be now? The grafting of more machine parts into our lives or the grafting of more human parts? Our lives are almost unthinkable without Internet connections, or without the oil brought home for us by the machines of war. To withdraw from either would be a far more potentially fatal shock to the system than the implantation of actual wetware cybernetics. An augmented reality optical chip, for instance, would only help facilitate our current condition, and would likely become socially enforced within certain economic brackets, just as smart phones were. Can we create a non-alienated cybernetic world? Can we even begin to conceive of what that would look like? We canâ€™t undo the past, but we can change the script of the future before it is acted out. Perhaps the challenge lies is finding new narratives that, instead of reacting against high technology, effectively reorient it towards serving human life â€” and humane values â€” instead of destroying them. The Luddite back-to-the-land ethos of the early environmental movement has given way in recent decades to a vision of a more integrated future. Our most viable version of a livable future is the Green Cyborg in which technology and humanity meet halfway and start caretaking rather than dominating the Earthâ€™s natural resources. This should be framed not as a return to neolithic, matriarchal values but as a forward synthesis of industrial technology and holistic thinking. This requires a simple shift in perspective from observing the world as a jumble of disconnected parts to observing it as an integrated system in which each part affects every other. It is a shift from seeing the world as parts in competition with each other to seeing it as parts striving for an emergent state of co-operative efficiency. A liveable future lies not in a wholesale rejection of the cyborg process of becoming welded to high technology, but in remembering that we are already cyborgs â€” that we are already inseparably connected not only to each other, but to everything on the planet, including even the worst parts of postindustrial society and its byproducts and side-effects. The challenges of this century will be cyborg ones. They will be challenges of synthesis â€” of discovering how to achieve balance within systems. We will work to establish an ever-evolving cybernetic balance within a frontierless, privacy-free, boundary-free, pluralistic world. This is not a New Age band-aid in which the easy answer is to simply realize that we are all one. Realizing that we are all parts of a single system is only the first step in effectively coping with and implementing that realization â€” work that may require more time than we have, yet which we must accomplish nonetheless. It is nothing less than the firm establishment and protection of our humanity and humaneness against all affronts to it; nothing less than remembering that we must use our tools properly lest we be used by them. Robocop canâ€™t be remade because itâ€™s no longer the story of one comic book hero â€” itâ€™s the story of all of us, left scratching our heads after the operation, struggling to integrate, hoping to one day remember what life was once like, left with the daily task of making sense and meaning of a mechanized world from which the only escape is that which we build from the scrapheap.